Not only will he be reunited with his former club, but he was also coached by Mourinho at Real Madrid, enjoying one of his best seasons under him when he scored 60 times in 55 matches during the 2011-12 campaign. However, while they have not been on opposite sides particularly often over the past decade, an in-form Ronaldo will surely be confident of improving a dismal record of one goal in 14 games against his compatriot, who has lost just one of five meetings with Juve as a coach. Ronaldo first faced a Mourinho team as a teenager while playing for Sporting CP, featuring twice in Primeira Liga games against Porto, with both ending in defeat. The attacker moved to United in 2003 and was a part of the team that was dumped out of the Champions League by Mourinho's Porto in the last 16 – the coach doing little to endear himself to the Old Trafford faithful with his victorious charge down the touchline during a 1-1 draw in England after Costinha's crucial equaliser. 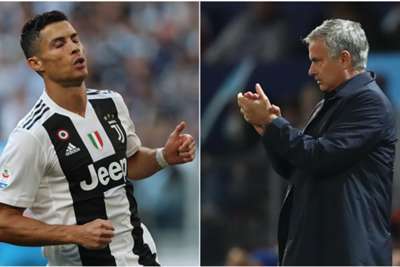 Mourinho then followed Ronaldo to the Premier League after guiding Porto to 2003-04 Champions League success, taking charge of Chelsea and becoming United's biggest rivals for the title. Ronaldo eventually got a first win over a Mourinho team in a Premier League outing at Old Trafford in November 2005, playing the full game and setting up Darren Fletcher's winner to end Chelsea's 40-match unbeaten league run. It took nearly four years for Ronaldo to get his next win – in 90 minutes – over a Mourinho team, as his Inter visited Old Trafford in the Champions League and lost 2-0 in March 2009. Ronaldo got United's second goal with a towering header, his only goal in 14 games against Mourinho, booking United's place in the quarter-finals. Happy birthday to former #MUFC star @Cristiano! Ronaldo's only outing against Mourinho's United was in the 2017 UEFA Super Cup, featuring for seven minutes as a substitute in Madrid's 2-1 win. That is his only appearance against his compatriot since 2009.